U.S. Coast Guard (USCG) search operations continue for a student reported overboard from a Japanese training vessel approximately 70 miles southwest of Kauai, Tuesday. USCG said its watchstanders at the Coast Guard Sector Honolulu Command Center were notified at 9:56 a.m., regarding a 17-year-old male Japanese national who was reported overboard from the 208-foot Japanese training vessel Hokuho Maru during transit from Honolulu to Japan. The man was last seen at approximately 2:50 a.m., and was reported missing after he did not show up for muster. A special Bangladesh anti-crime unit on Wednesday arrested the owner of a ferry that sank in a river killing about 110 people, the first time authorities took such action in a country where shipping accidents with heavy loss of life are common. The ferry capsized and sank during bad weather on Aug. 4 in a river swelled by monsoon rain about 30 km (18 miles) south of the capital, Dhaka. The vessel had a capacity for 85 passengers but was crammed with about 250 people returning to work in Dhaka after spending the Eid al-Fitr holiday in their villages. 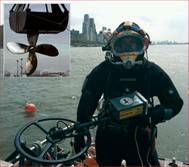 Randive, a commercial diving company based in New Jersey, is employing underwater metal detectors in their search and salvage operations. The company was founded in 1959 by Randor Erlandson, and in the early days focused primarily on the needs of the maritime industry around the ports of New York and New Jersey. In the decades since, the company has greatly expanded its operations increasing its staff to 16, and adding as its clients some of the largest shipping companies in the world.